I have another Trendy Twine project on the blog today. I love this Candy Cane twine! It is one of my favorites color combinations. 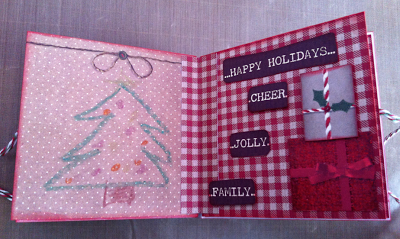 I was dying to use it to do a Christmas book after my Thanksgiving book turned out so great. I hope you like this one too! To make the cover I cut a piece of red checked cardstock to 4" x 8.5". I scored it at 4" and 4.5" to create a 4"x4" album with a .5" spine. I embellished the cover with stamped stitches and a few cut outs popped up on foam dots. The finishing touch is the Candy Cane twine bow with a heart gem in the center. For the closure I cut 4 pieces of twine at 8" and glued 2 pieces to the inside front and inside back of the book then glued down a piece of patterned paper over the twine to finish off the cover and hide the extra twine. Now the twine can be tied in a bow to close the book. For the pages inside I cut 10 pieces of cardstock at just slightly smaller than 4" sq. They are glued back to back to create 5 pages. They are then attached to the book with hinges made of 1"x4" strips of paper scored in half. I hope this shot gives you an idea how the hinge works. I had the kids do a few drawings inside for their grandparents then a popped up a few more cut outs. We also wanted to include a gift card in the book so I made a little pocket. ﻿I just cut a strip of cardstock and glued 3 sides down to the pages with the top open to hold the cards. Added a sentiment popped up on foam dots. This is a really personal, fun gift for any family member to enjoy. I am making them for everyone! I really hope I have inspired you to make your holiday gift books this year. To order your Candy Cane twine and find more Trendy Twine inspiration please visit the blog at http://trendytwine.blogspot.com/. Make sure you join the December Challenge for a chance to win some yummy twine! Can you believe it's December already? I am so excited for Christmas crafting and this little tag is the cutest project to start out this fantastic month. I am in love with Candy Cane Trendy Twine! 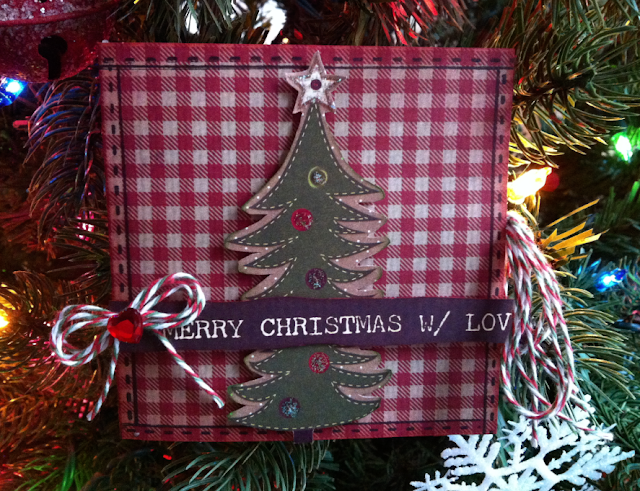 The triple color twist matches perfectly with the Doodlebug North Pole paper I chose for my tag. I started out with a 3.5" x 2.5" green glitter cardstock base. 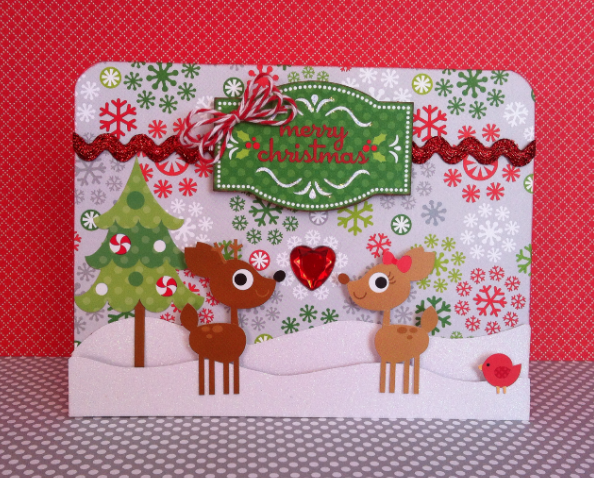 The corners were rounded and the edges inked in red. The snowman tag is a punch out from Doodlebug that I inked the edges in red, stickled the frame with crystal glitter and added google eyes to the snowman. 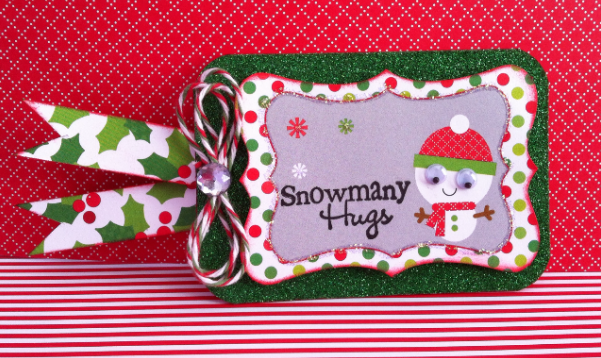 I stamped the Snowmany Hugs sentiment from My Creative Time in black and attached to the green base with foam dots. The holly flags were created by cutting strips of paper to approximately 3" and cutting "V" at the end. The edges were inked in red then attached to the back of the green base. The final touch is a triple Candy Cane twine bow finished with a clear gem in the center. So easy, so quick, and so much fun to make. This is my kind of project! I hope you enjoyed today's project. For all things Trendy Twine and to join the December Challenge, please visit the website http://trendytwine.blogspot.com/. Thanks for hopping by! Come back soon for more inspiration.